We are a family of 5 - parents of 3 teenage children aged 19, 17 and 16 from Australia. 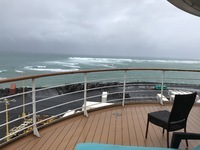 This cruise was the first week of a 2 week holiday, followed by 6 nights in Waikiki. We had a great time on this cruise and loved the perks of being suite guests, which included breakfast and lunch at Cagneys plus a 3 meal specialty dining package. 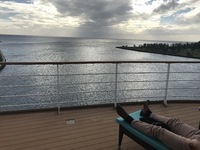 Other benefits included priority tender access into Kona and seamless quick disembarkation at the end of the cruise, thanks to Thomas, the Concierge. Our butler, Cesar, delivered canapes each evening and was always available to help with reservations. There was even a surprise delivery of bottle of sparkling wine and cheese plate to enjoy on our balcony for the Friday pm cruise past the Napali Coast. Super service above expectations, for which we tipped $5-10 per day. We think it is good to acknowledge excellent service. We arrived at the cruise ship terminal straight from the airport at around noon. The queue was enormous, and it took us 45 minutes to drop our bags and get through security and to the Suite check-in. This and re-boarding at Kona were the only times we had to queue. Activities and Day trips - The weather impacted our plans on 2 days. We hired cars through Hertz at all ports except Kona, so we could be flexible. Due to torrential rain on our second day in Maui, we changed our plans from a drive up to Haleakala Crater to a short drive along the Road to Hana, where the waterfalls were raging. In Kauai, the bridge to Hanalei was under water, so we changed plans again to explore Princeville and play a bit of mini golf. Driving is easy and parking is usually easy to find, except for near the port in Maui. This port could benefit from improving overnight parking options for cruise passengers. On board, my daughter and I attended a couple of lei making classes and the Hawaiian ambassadors are an absolute delight. Beware: The kikui (candle) nut leis are NOT allowed into Australia, even though the Hawaiian ambassador said that they are. Please declare these to Australian Customs on arrival if you want to try and bring them back and do your bit to protect Australia&apos;s environment. Dining - Breakfast each morning was fresh and delicious at Cagneys, and the Restaurant Manager had our table for 5 ready most mornings when he could see us walking along the deck. We had 3 lunches and 1 dinner at Cagneys (delicious), dinner at Skyline (good), one dinner at La Cucina (superb! ), 2 dinners at Cadillac Diner (fun, and great service from Jerry), one dinner at Jefferson&apos;s Bistro (fine, but please go with the waiter&apos;s recommendations!). We also had one dinner at Liberty, which was the only meal that wasn&apos;t on a par with the others. Delays in service meant that we missed the show this evening (not a big deal for us), but the next day the waiter sent a plate of cookies to our suite with an apology for the delay. Very thoughtful. We didn&apos;t eat at the Aloha buffet, because some of us do not like buffets. Drinks - Yes, they are expensive. However, we purchased a 6 bottle wine package on our first day which lasted the cruise. This was a better deal than purchasing individual bottles. We also had the occasional Negroni cocktail pre or post dinner - highly recommended. Entertainment - We saw a couple of shows and a couple of variety events, but mostly enjoyed our own company each evening. There is really not much for teenagers to do in the programme, although they did enjoy and use the extensive fitness facilities. In summary, this cruise exceeded our expectations. To get the most of out of it - hire a car for exploring, book the suite, buy the wine, eat at the specialty restaurants, tip good service....and enjoy! Fun, memorable and better than expected, but book a suite! Port of Hilo. All the port activity was on the other side! 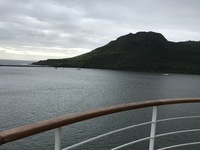 In port at Lihue. Port activity not on port side! We are a family of 5 - parents of 3 teenage children aged 19, 17 and 16 from Australia. 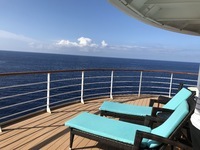 This cruise was the first week of a 2 week holiday, followed by 6 nights in Waikiki. 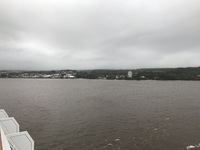 We had a great time on this cruise and loved the perks of being suite guests, which included breakfast and lunch at Cagneys plus a 3 meal specialty dining package. 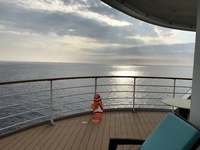 Other benefits included priority tender access into Kona and seamless quick disembarkation at the end of the cruise, thanks to Thomas, the Concierge. Our butler, Cesar, delivered canapes each evening and was always available to help with reservations. 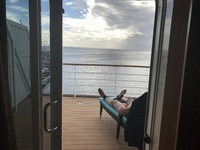 There was even a surprise delivery of bottle of sparkling wine and cheese plate to enjoy on our balcony for the Friday pm cruise past the Napali Coast. Super service above expectations, for which we tipped $5-10 per day. We think it is good to acknowledge excellent service. We arrived at the cruise ship terminal straight from the airport at around noon. The queue was enormous, and it took us 45 minutes to drop our bags and get through security and to the Suite check-in. This and re-boarding at Kona were the only times we had to queue. Activities and Day trips - The weather impacted our plans on 2 days. We hired cars through Hertz at all ports except Kona, so we could be flexible. Due to torrential rain on our second day in Maui, we changed our plans from a drive up to Haleakala Crater to a short drive along the Road to Hana, where the waterfalls were raging. In Kauai, the bridge to Hanalei was under water, so we changed plans again to explore Princeville and play a bit of mini golf. Driving is easy and parking is usually easy to find, except for near the port in Maui. This port could benefit from improving overnight parking options for cruise passengers. On board, my daughter and I attended a couple of lei making classes and the Hawaiian ambassadors are an absolute delight. Beware: The kikui (candle) nut leis are NOT allowed into Australia, even though the Hawaiian ambassador said that they are. Please declare these to Australian Customs on arrival if you want to try and bring them back and do your bit to protect Australia&apos;s environment. Dining - Breakfast each morning was fresh and delicious at Cagneys, and the Restaurant Manager had our table for 5 ready most mornings when he could see us walking along the deck. We had 3 lunches and 1 dinner at Cagneys (delicious), dinner at Skyline (good), one dinner at La Cucina (superb! ), 2 dinners at Cadillac Diner (fun, and great service from Jerry), one dinner at Jefferson&apos;s Bistro (fine, but please go with the waiter&apos;s recommendations!). We also had one dinner at Liberty, which was the only meal that wasn&apos;t on a par with the others. Delays in service meant that we missed the show this evening (not a big deal for us), but the next day the waiter sent a plate of cookies to our suite with an apology for the delay. Very thoughtful. We didn&apos;t eat at the Aloha buffet, because some of us do not like buffets. Drinks - Yes, they are expensive. However, we purchased a 6 bottle wine package on our first day which lasted the cruise. This was a better deal than purchasing individual bottles. We also had the occasional Negroni cocktail pre or post dinner - highly recommended. Entertainment - We saw a couple of shows and a couple of variety events, but mostly enjoyed our own company each evening. There is really not much for teenagers to do in the programme, although they did enjoy and use the extensive fitness facilities. In summary, this cruise exceeded our expectations. To get the most of out of it - hire a car for exploring, book the suite, buy the wine, eat at the specialty restaurants, tip good service....and enjoy! Wow! This suite was perfect for us. We put our 2 teenage boys in the main bedroom and our teenage daughter in the little cabinette which was perfect for her. This way the boys could sleep peacefully in a proper bed, while my husband and I took the sofa bed and had the balcony to ourselves in the early mornings and evenings. And what a balcony! We enjoyed sunrises and sunsets and there was no better place to be during the Napali Coast cruise-by. Each morning we asked our cabin steward to make up the beds so that we had more space during the day and our beds were ready and turned down after each evening meal. For this service we tipped him $5 per day, and considered it money well spent. Yes the bathroom is small, but how much time do you want to spend in there? 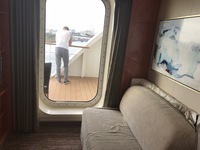 It is interesting to note that although Suite 10678 is located port side, many of the views while in dock were of the ocean due to the structure of the ports (see photos). Hertz in Hilo are staffed by the most helpful people we came across. Shuttle available to and from cruise ship, and we were given easy directions to Rainbow Falls and V.N.P. The falls were spectacular. We were dismayed to hear that 2 tourists had lost their lives just the weekend before entering the water above the falls. Please pay attention to all warning signs. It is not safe to swim here. We then had an easy drive to Volcanoes National Park, where we enjoyed a presentation by a local ranger (free of charge) and explored other sites in the park. Thurston Lava Tube was full of puddles (more like lakes) so there was no choice but to remove shoes to wade through to the other side. Felt very intrepid. This was a major highlight of our entire trip. Very well run and safe. Just do it! Allow time for lunch at the Keana Farms van nearby for delicious meals made with local produce. We hired a car from Alamo at a very cheap rate online, and drove to Hanauma Bay (very easy, less than an hour). We had our own snorkel gear. Could&apos;ve done with a beach umbrella as shade is scarce. A must do activity in Oahu. We booked our tickets to the Arizona Memorial online in advance but were able to swap them for an earlier time on the day, which was lucky as the winds were expected to increase and later trips may have been cancelled. We also visited Bowfin Sub and the Missouri, which was very very interesting. We had a wonderful lunch at Restaurant 604, which is within walking distance of the Visitor Centre. Great fish tacos, the best bloody Mary and very good prices. We took a taxi there and back for $30 for the 5 of us. So, we had intended to visit Hanalei and the destinations beyond, including the wet and dry caves. Unfortunately, the bridge was under water and the road to Hanalei was cut after Princeville, so we had to make alternate plans. We decided on a round of mini-golf at Anainahou followed by refreshments at their cafe, which was lovely. The helpful guide here suggested we explore Princeville and go down to Hideaway Beach, so we thought this sounded like a good plan. We drove into Princeville but all of the public parking places were full, so we drove into St Regis Resort, where the concierge gave us FREE valet parking and specific instructions for where to find the steep and muddy trail leading down to Hideaway Beach! Now this was exploring! We then headed back along the coast and after a bit of island sightseeing, stopped at Sam&apos;s Oceanview at Kapaa for Happy Hour. With the hire car we had the flexibility to do this. Turtle Beach is a lovely spot for easy snorkelling. We took a short taxi ride from Kona and spent a couple of hours swimming with fish and turtles. The local conservation group has a lot of information about the fish to be seen here, including the humuhumunukunukuapua’a (Hawaiian state fish). Easy snorkelling. Take reef shoes if you don&apos;t have fins. You can also hire gear here. 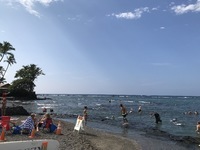 On our first day in Maui we drove to Old Lahaina Town where we parked at the Baby Beach car park and walked along the seafront into the town. 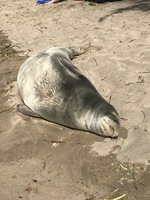 There was a Monk seal sunbathing amongst all the other beach goers on the beach! After exploring the old town we drove to Ka&apos;anapali Beach for a bit of snorkelling. From this beach you can watch people jumping from Black Rock into the sea. We drove back to port and parked in the carpark of the shopping centre opposite, risking towing, but felt we had no other option. A solution for cruise ship visitors with rental cars would be very welcome here! For our second day, we planned to drive up to Haleakala Crater, but with low visibility due to extremely heavy rain we decided to take a short drive along the Road to Hana. The benefit of all that rain was that the waterfalls were spectacular! We went as far as the Botanic Gardens, which were lovely, but returned to the ship early in time for lunch at Cagneys and a rest in the afternoon on our deck.